In 2018, 2,849,600 tourists from 196 countries arrived in Azerbaijan, showing a 5.7 percent increase compared to 2017, Trend reports referring to the State Statistics Committee of Azerbaijan. 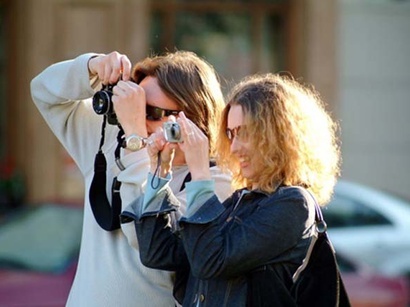 Looking at the origin countries, Russians make up the largest part of the tourists havin a share of 30.9 percent, while 21.4 percent came from Georgia, 10.2 percent - Turkey, 8.5 percent - Iran, 3.3 percent - the United Arab Emirates, 2.6 percent - Saudi Arabia, 2.4 percent - Iraq, two percent - Ukraine, 1.4 percent - Israel, 17.2 percent - citizens of other countries, 0.1 percent - stateless persons. Men accounted for 66.1 percent of those who arrived in Azerbaijan, while women accounted for only 33.9 percent. Azerbaijan received most tourists in July (11.6 percent), in August (11.3 percent), in March (9.7 percent) and in June (9.5 percent). On the other hand, tourists visited Azerbaijan less in February (5.8 percent), in January (6.5 percent) and in May (7.3 percent). In 2018, the largest increase in the number of incoming tourists was observed among the citizens of the Gulf countries (except for the UAE and Iran). The number of Saudi Arabian citizens increased 2.2 times, Bahrain doubled, Kuwait 1.8 times, Qatar 1.6 times, Iraq 7.9 percent, Oman 7.4 percent compared to 2017. On the other hand, the number of arriving Iranian and Emirati tourists decreased by 33.7 and 8.3 percent, respectively. In general, 554,100 people came from the Gulf countries, and almost one in five who arrived in Azerbaijan was a citizen of these countries. Compared to the previous year, the number of tourists from India increased by 2.7 times, Israel - by 2.6 times, Egypt, Turkmenistan and South Korea - by 1.7 times and from China - by 1.5 times. As for the EU citizens coming to Azerbaijan, in 2018 their number increased by 6.7 percent to 112,500 people, while the number of the citizens of CIS countries went up by 3.8 percent and reached 1,044,200 people. Rail and road transport were used by 57.5 percent of those who arrived in Azerbaijan in 2018, while 41.5 percent opted for air transport and only 1 percent arrived by water transport. In recent years, the creation of a diversified tourism infrastructure in Azerbaijan has increased the interest of foreign tourists to the country. There are many opportunities for tourism in our country, including rural, health, environmental, cultural, social, commercial, sport and etc. Simplification of visa regime also plays a major role in the development of tourism in Azerbaijan. Currently, citizens of a number of countries get visas right at the Azerbaijani airports, while other tourists can visit the country by getting online tourist visas.